If you live anywhere in “snow country”, you’re very familiar with Pro-Tech products, even though you may not realize it. 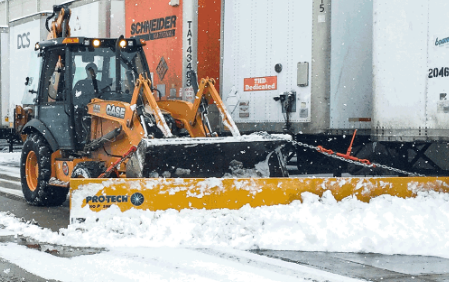 After a winter storm, it’s quite likely that your local big box store’s parking lot will cleaned out with a wheel loader or skid steer sporting a Pro-Tech Sno-Pusher. Fact is, Pro-Tech is North America’s largest containment plow manufacturer. As a testimony to their size, the company employs 30 full-time welders. Thousands of companies prefer one or more of their 80+ models and keeping track of manufacturing parts, labor, inventory and orders had become a real nightmare for the company. From the very beginning of their search for a new ERP and an integrated enterprise system, Muto and his team knew they wanted to go with a cloud solution. To begin their search for a cloud ERP, Muto and his team used the Internet and began reaching out to cloud ERP providers, looking for companies that would be a good fit. When a good possibility popped up, Muto would phone a company representative. They initially settled on NetSuite, but the more they looked, the more they were concerned about the depth of the software on the manufacturing side of the ERP. Then, they had an epiphany of sorts. Cloud provides better accessibility. From anywhere, our people would have access to our systems to check on order status or whatever information they, their customer or vendor needed. “We used an outside firm to install our Salesforce CRM,” relates Muto. “However, when we got to implementing Rootstock, we decided to do it ourselves, using the guidelines on Rootstock’s customer resource site. When we needed some help, our Rootstock Project Manager talked us through it. Bottom line is that we got the installation completed both within time and budget. Everyone has been very happy with the implementation and how the software performs. Our customers’ responses were especially gratifying, as we wanted the whole undertaking to be transparent to them and it was. As a result of installing Rootstock ERP, we are better serving our customers. Muto likes to relate an interesting side benefit to having an integrated system. Shortly after installing the system, Pro-Tech brought on a new sales representative. Using their new system, Pro-Tech can now teach people new to the organization how their process flow works, quickly and easily. Instead of having to jump from system to system, the team is able to stay in the same place, making the training much simpler to conduct and easier for the new employees to comprehend. Pro-Tech sales representatives appreciate being able to refer to sales orders while on the road and, as a result, have found the entire sales order system much easier to use. In the past, Pro-Tech did not create work orders or inventory reports. Since implementing the new system, they have found doing both is actually quite easy on Rootstock. Muto also likes the information he has available. Rootstock cloud ERP will plan, track and cost inventory items by customer, customer/project or contract. Once a project budget is set, actual labor, material and other charges are tracked and visible in real-time. Up-to-date project actual vs. project budget numbers are just a click away. Switching to an integrated enterprise system with best-of-breed software solutions, including cloud ERP, on the Salesforce platform is paying dividends for Pro-Tech. “Our lead times are much better and our business processes have been streamlined,” Muto acknowledges. To learn more about the Pro-Tech, please visit snopusher.com.